I started accumulating information for this article a while ago… but now it may be a bit late for the title. 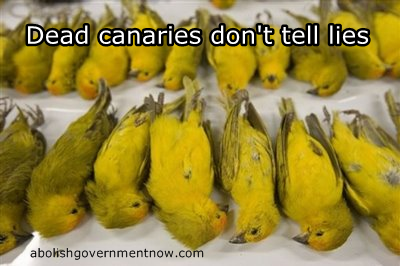 As the story goes, canaries were taken into coal mines to be used as an early warning system for coal miners. As the birds are very sensitive to the gasses that can accumulate in coal mines… if the bird dies… it’s time to leave. The analogy for financial markets… is to look for the early warning signs of an impending collapse… but we’re already looking at ‘dead miners’… with more than $4T wiped away in the last few days alone. The points are still relevant though, as many of the ‘perma-bulls’ are still talking as if this is ‘just a minor correction… in a strong market sitting in a solid economy’… and that investors should continue to ‘buy the dip’. After all, we saw a 10% drop in October last year… and the market bounced right back. That bounce however… appears to be the result of ‘calming words’ from Fed board member James Bullard suggesting that The Fed was ready to step in with more QE if necessary. This time… The Fed is stuck in a corner. They desperately need the market to think that everything is fine… that the economy is so strong that it is actually overheated and needs to be ‘cooled’ with an interest rate hike. If they were to suggest that more QE is possible… they lose all of the value in their efforts to promote that lie… a lie that they need the market to believe. So, it is still possible that The Fed will not just ‘make another statement’… but could actually issue more QE. The risk there though… is that after seven years and $5.5T in stimulus… it is probable that the market will lose faith in The Fed’s ability to control the market. It doesn’t help that Fed Vice President Williamson said that there is no link between QE and the goals of The Fed (2% inflation, 5% unemployment and real economic activity). Faith is all that this market has… faith can’t be lost. Even if The Fed does try something… doing so risks a loss of faith. More importantly… all they can do is delay the inevitable… by making the resulting crash that much bigger. Their stock market has dropped more than 30%. Draconian efforts to stop the bleeding… have failed. With tens of millions of apartments built… and left empty in an effort to maintain growth numbers, the misallocation of capital has led to a bursting of the bubble in China’s real-estate market as well… which will only get worse and spread to the rest of the world. Deflation is often associated with a shrinking of liquidity. As credit is tightened (usually in an effort to control an overheated economy) the money supply is decreased by a large multiple since credit creates many multiples of ‘new money’. The M2 money supply in China has been reduced recently by 30%. This coincides with ‘capital flight’ from China in historic size… that prompted threats of prison for those attempting to move money out of China. Debt is a killer. Unfortunately, central banks and national governments have promoted ‘central planning’ for economies… without an understanding of how economies actually work. Instead of cutting spending, reducing debt, reducing regulation… their answer is to try to borrow their way out. The only ‘good debt’ is debt that produces a return sufficient to pay off the loan. The first attempts to stimulate the economy with borrowing were very successful… producing more GDP than the amount borrowed. Today every dollar of new debt produces just a few pennies of new GDP. Consider how long you’d last in a casino with that type of return on every dollar bet. The ‘manufactured’ growth in China pushed commodities into a bubble. An example of the extremity is that China used more concrete in 3 recent years… than The US has in the past 100 years. Of course, central planning always fails… it was paid for with borrowed money and the growth was not sustainable since is was based on fiat not market demand. The result is that commodities suppliers have geared up to sustain high levels of production… leveraging the very high prices with the expectation that prices would remain inflated forever. Now that demand is crumbling, suppliers have no choice but to drop prices to generate SOME degree of revenue in an effort to pay the loans taken to pay for the ramp up in production… into a market that never really existed. Next comes layoffs, shut downs and bankruptcies as is already being seen in the shale oil space. While a third bailout in Greece seems to have calmed the Euro-zone… it doesn’t fix any of the foundational problems that face Greece (as well as Italy, Spain and France). It’s just another kick at the can. The inventory to sales ratio has been climbing for years and now exceed sales. This happens as businesses fall for the lies of The State… and build capacity into an economy that ‘isn’t real’. 5.5% unemployment should represent great strength… but that number is so fake it should not even be considered. The reality is that there are only 86MM private sector jobs and there are 94MM working age americans not in the work force… and 146MM receiving some form of welfare. Just like the commodities space… business in general will be forced to slash prices… followed by reduction in capacity, layoffs and bankruptcies. The DOW recently showed a death cross… where the 50 day moving average fell below the 200 day moving average… a solid signal of a trend change toward the negative. More importantly, the broader market is also in trouble with 60% of the S&P 500 stocks showing a death cross. Junk bonds (high risk corporate bonds) have been in high demand due to the requirement for return that has not been possible with safer investments. The sell off has begun… cutting bond value significantly… pushing their corresponding interest rates to record levels. Unfortunately for holders… when we hit full ‘panic mode’… there will be practically no buyers due to new regulations in the market limiting bank’s ability to participate in junk bonds. In the last hundred years… only 3 bull market phases have lasted longer than the current expansion… and none are similar to our circumstances. By average length alone… we are due for a bear market. Ironically, there is a trend at the end of an expansion cycle… for unemployment numbers to drop significantly. We are now at the lows since the ’08 collapse… and at lows that are close to historic lows (acknowledging that it is a fake number that is almost meaningless). One problem with China is the opacity. No one really knows what’s going on… and few believe the ‘official story’. One solid measure is international shipping. Based on what can be measured… China not only does not look like it’s experiencing a 7% rate of growth… but appears to already be in recession. In our own back yard… Puerto Rico recently defaulted on debt payments. Ironically, The US is worse off by several measures. As nations that traditionally export face dropping export sales… there has been a race to debase the currency. Printing money (lowering interest rates, expanding credit availability, lowering credit standards and QE) has the effect of making the local currency worth less in exchange with others. The lower currency makes that country’s export products cheaper. The problem is that when everyone does it… no one benefits… and The US is the only one that isn’t currently in an active debasement mode. So, the US dollar has skyrocketed relative to all others making US products incredibly expensive… and US companies that profit outside of The US lose money translating those earngings back to US Dollars. Even worse is the debt borrowed outside The US… but borrowed in US dollars. Those debts become significantly more expensive as local currency buys fewer dollars… putting emerging markets in a very bad position. For all of the ‘great employment numbers’ that we’ve seen, consumer spending has been flat. That is because very many of the ‘new jobs’ are in low paying service industries like hotels, waiter and bar tenders. Real household average incomes have actually dropped since ’07… and as the collapse progresses… these ‘bread and circus’ service sector jobs will be the first to be shed. In summary… what will no doubt be the greatest financial collapse in world history… is knocking at the door. It is my personal expectation that more than 10MM Americans will die for lack of basic resources when the government checks stop or become worthless. The entirety of death and destruction that we are headed full steam toward… is a direct result of the failed attempts at ‘central planning’ (aka communism) which always fails… always results in mass death and destruction… exists to benefit the top 1%… and is completely unnecessary.